Which caused my parents for to frown and prove my destiny. I’m in hopes to see my handsome girl at Sweet Recale once more. For loving of a pretty fair maiden in the town of sweet Recale. This Jim McGrath may likely have been James E. McGrath, son of John McGrath from Wicklow, Ireland and a successful (for a time) lumber company operator for whom the town of McGrath, MN is named. In any case, singer Jim McGrath was still in the Stillwater area in 1934 and in Stanchfield’s unpublished papers at the Minnesota Historical Society, she writes that, though he was a reluctant singer, “after one old-timer, then another, dropped into the office to tell of [McGrath’s] clear tenor and his great memory for the old songs” McGrath finally relented and began recalling for her “those pleasant evenings in the bunk house” and the songs that went with them. The Stanchfield papers include part of McGrath’s text for “Sweet Recale.” I have mixed the McGrath text with melody and text again recorded by Alan Lomax in 1938 from Beaver Island, Michigan singer John W. Green (you can listen to Green’s version online via the Library of Congress) and a few lines nabbed from a third version collected in 1935 in Alger, Michigan by Gardner and Chickering. I have found three 19th century broadside versions of this ballad from Ireland where the place name is either Belfast, Derry or Limerick instead of Recale. Lomax spells it Raquale and Gardner spells it Recail. I assumed it was a Great Lakes place name until another version recently turned up on the Irish Traditional Music Archive from Inishowen Penninsula singer Denis McDaid who sings Rycale. I’m at a loss as to the location of this mysterious place name! And the red was on your cheeks, Mary, and the love light in your eye. And I still keep listening for the words you never more will speak. For I’ve laid you, darling, down to sleep with your baby on your breast. There is little left to care for now since my poor Mary died. But I’ll not forget old Ireland, were it twenty times as fair. And the springing corn and bright May morn when first you were my bride. This heart-wrenching ballad of Irish immigration comes from Minnesotan Michael Dean’s Flying Cloud songster and I have married Dean’s text with the melody sung by John W. Green of Beaver Island, Michigan. You can hear Green’s version online via the Library of Congress. The recording, made in 1938 by Alan Lomax, captures Green’s wonderful ability to vary melody and ornamentation as he sings each verse… a characteristic that is hard to capture in a transcription. I tried to “loosen up” the melody a bit in singing the song myself. A stile is a structure that allows people, but not animals, to pass over a wall or fence, often via steps or a ladder structure. A common feature in 19th century Irish farm country, one can imagine this as an attractive perch for courting. The last verse of this song text (which appears in some, but not all, British broadside versions as well) is intriguing in that it describes the emigrant’s destination as among the “grand old woods.” This seems to hint at the immigration pattern I so frequently discuss in this column–Irishmen coming to the north woods of North America and, often, working in the woods as lumbermen. 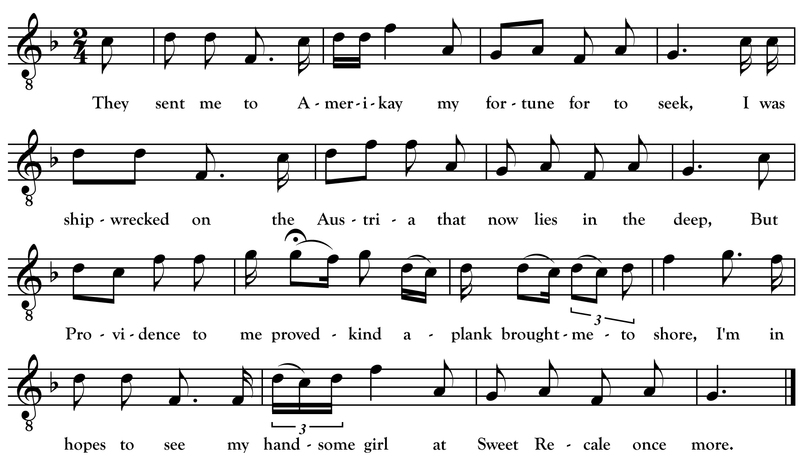 Both singers I sourced this song from were born to Irish immigrant fathers who pursued this type of work and settled in small lumber-based communities in the Great Lakes region. I bless you, Mary, for that same, though you cannot hear me now. O! I’m thankful you are gone, Mary, where grief can’t reach you more! And it leaves me a life’s prisoner in Stillwater jail to die. For which I will be sorry until my dying day. And we’ll chase the mountain guerrillas until our dying day. A-drinking lots of good old brandy for to drive the blues away. And on the Nebraska prairie their mouldering body lies. 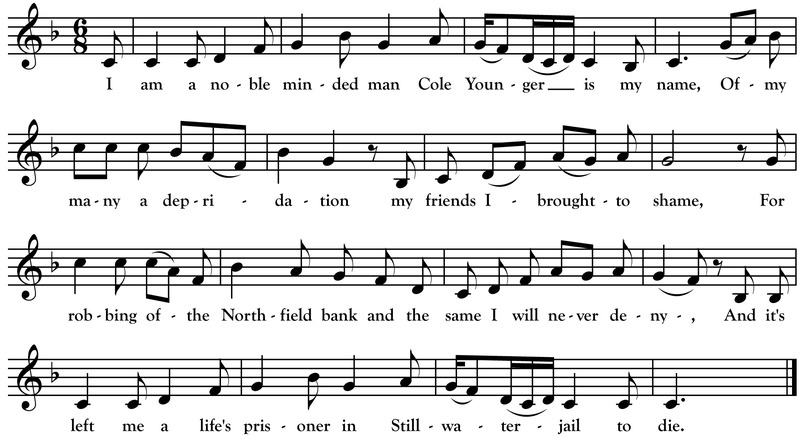 In ten years of searching through archives and old song books for Irish-influenced songs from the Great Lakes region, I have found only a handful of texts that include Minnesota place names. Of the few I have found, I consider this one the best! It is about one of our state’s most notorious historical events: the raid by the James Gang and the Younger Brothers on the Northfield Bank in September 1876. Cole Younger survived the shots fired by citizens of Northfield that day and then 25 years in the Stillwater prison before being released. His celebrity as a real outlaw helped him make a living after release and he attempted to cash in with his own “wild west show” and a published memoir. Today, there are many resources online and in print that tell the fascinating stories of the James Gang, Cole Younger and the Northfield raid-gone-wrong. I came across the ballad “Cole Younger” in a few books but fell in love with it when I heard it sung by Beaver Island, Michigan singer John W. Green. Versions of the ballad were collected all over the US but Green’s is by far the most Irish-sounding treatment I have found. Green was a prolific traditional singer and the focus of Alan Lomax’s field recordings during his visit to Beaver Island in 1938. You can hear Green singing the song online thanks to the Library of Congress’s recent digitization of Lomax’s Michigan recordings. 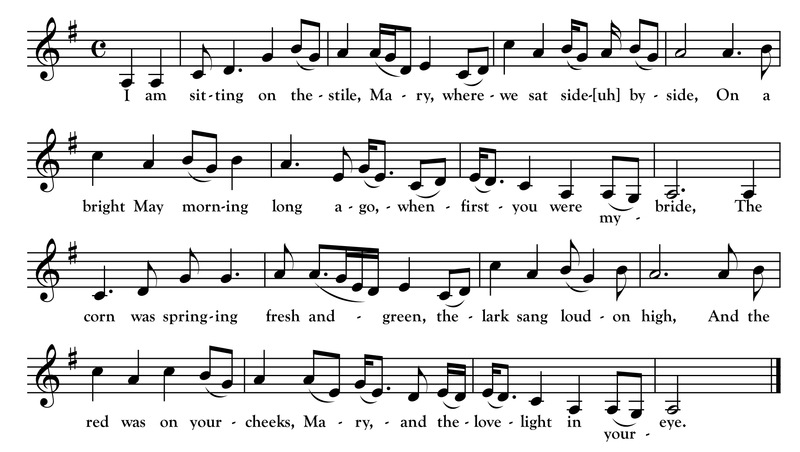 It is impossible in a transcription (such as mine above) to do justice to the lovely variations and ornamentations that Green puts into each verse as he sings. He was an older man at the time of the recordings and not always in command of his voice but his singing includes many flourishes that hint at the masterful singing community, full of first generation immigrants from Donegal, that Green grew up in on the island in the late 1800s.